The MSUB is designed specifically for riders who rise up to ride. Enjoy a comfortable, upright posture and full body workout. The MSUB brings 27.5” tires to the SUB family, with versatile, durable tread. Stay smooth on hard pack and rock. Dig through loose dirt and loamy conditions. This tire allows the MSUB to do it all. Ride confidently with smooth 100mm suspension and high-performance disc brakes. The 10 gears provide a large range of resistance, allowing you to climb up to 20-30% grades and sprint at speeds of 20mph+. A bike this unique deserved an eye-popping color palette: matte black, aqua and orange. 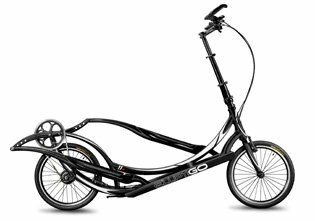 ElliptiGO MSUB 0 out of 5 based on 0 ratings. 0 user reviews. Whether you’re looking to start shredding or to simply get moving, the MSUB is ready to help you reach new heights. From urban streets to single track, from fire roads to beach paths, our most versatile bike is ready to take you anywhere. Ready for anything. Made for everywhere. Explore your world with knobby, 27.5” tires, smooth, 100mm suspension and high-performance disc brakes. See it in action!